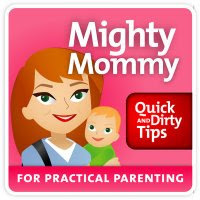 We were honored to be featured on the Mighty Mommy podcast, Quick and Dirty Tips for Practical Parenting. Mr. Chris and I have been listening to her podcast since our son was a newborn. She provides quick tips on subjects ranging from potty training to reading with your children. It was fun to write her a tip about the strategies we use to teach patience to our two young children. We had written about it in this blog post and posted a story about it called, "Captain Destructo". We'd like to extend a special welcome to any visitors from The Mighty Mommy. You can find links to all our original stories to the right. We would love to hear what you think! Feel free to contact us by leaving a comment on the blog or at nightlightstories@gmail.com, subscribe for free via iTunes, follow us on Twitter at nightlight08, or join our fan page on Facebook at Night Light Stories. As always, I look forward to the many stories we can share together!